If there is one thing the world needs more of, it is dog-themed slots titles. 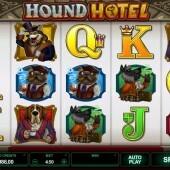 Luckily, the game developers at Microgaming have decided to remedy that problem by launching this pooch lovers paradise slot called Hound Hotel. 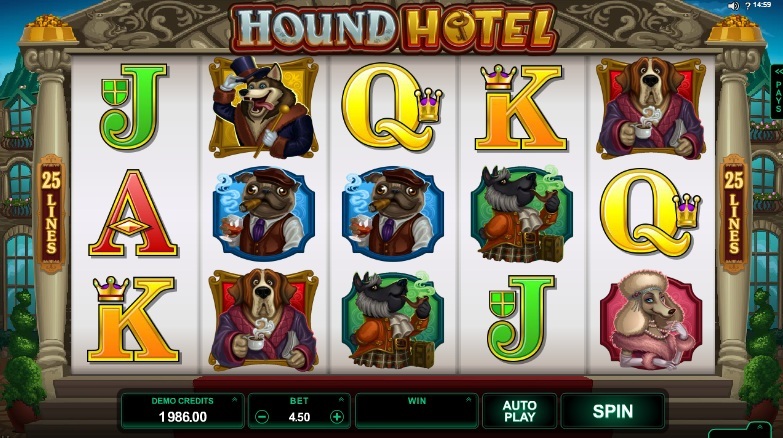 Hound Hotel is a 5 reel, 25 payline slot that revolves around the fictional Hound Hotel. This is a hotel that is staffed and visited by a variety of dogs. Yes, it's not exactly the Grand Budapest Hotel and you certainly won't find Ralph Fiennes pacing the corridors of this fine establishment but the theme is quite amusing. The symbols consist of the different doggies that are present at the Hound Hotel. The different dogs that are dressed in a wide variety of elegant attire include a poodle in pink, a pug in a flat cap, a Scottish Highland terrier wearing a cravat, a hound wearing a silk robe, and husky in full evening wear. The Hound Hotel logo acts as the game's Wild symbol. This symbol has the power to substitute for all other symbols, except for the Scatters, to complete any potential winning combinations that appear on the reels. The Wilds can also appear as Stacked Wilds. Woof, Have Some Dashing Wilds Too! This is not the only power the Wilds possess on this game. A randomly triggered Dashing Wilds Bonus occurs on any non-winning spin. Three Dashing Wilds will appear on the reels and will move over the reels before landing on a position when the reels stop spinning. These Dashing Wilds hold the same powers that ordinary Wilds do. The Scatter Dog represents the slot's Scatter symbol. This symbol is the key to triggering the Hound Hotel Bonus. You will need to hit three or more of the Scatters across the reels to trigger the bonus feature. This is a Pick 'em Bonus where you must select from a number of doors on three floors to reveal a number of free spins, a multiplier value, and a Bonus Wild feature. It is possible to earn up to 30 free spins. You can also win up to a 6x multiplier. Finally, there are a number of Bonus Wild features up for grabs including Expanding Wilds, Super Stacked Wilds, Wild Reels, Super Wild Reels, and Split Wilds. These will all be activated for the duration of the free spins. Hound Hotel is a great concept from Microgaming. It reminds me of the comical Diamond Dogs slot from the Swedish developer NetEnt but it also has the enjoyment of the more seriously-presented Rex slot from Novomatic . The potential wins from the huge selection of Wilds you can hit makes for a superb gaming experience but, as with the majority of Microgaming slots, the big wins are harder to hit than you'd like. Nonetheless, I'm not really excited by Microgaming slots because they are two for the penny these days but this is one that you might want to get your paws on.